Home > Current & Future Franchising > DIANA Co.,Ltd. Diana's franchisee, so called Chief Proportion Counselor, provides: “Beautiful Life” that fulfills the woman's dream of beautiful well-proportioned figure and nurture a vibrant sound and rich mind, as well as “Rich Life” that can be self-realized by creating healthy time with friends and economic affluence to expand the range of life. The business of Diana is successfully established as the franchisee considers from the standpoint of the site and the franchisor supports it from the backend. Currently we are developing about 750 franchise salons in Japan. 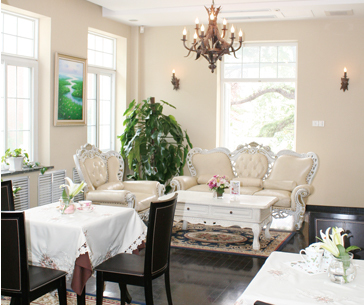 At each franchise salon, we are developing the business in the area related to beauty and health. As our business concepts, we support the realization of the figure that women want to become by “tools (merchandises)” in three areas of corrective undergarment, cosmetic and health food. Since the foundation in 1986, we have been developing the businesses specializing in women’s beauty and health for about 32 years. We have approximately 130,000 total customers and our figure size data measured in the past at our franchise salons have exceeded 900,000. Based on this data, we constantly evolve scientifically backed evidences and derive the ideal figures. Utilization of our tools and the support and advice by the franchise owner called “Chief Proportion Counselor” makes it possible for us to realize the ideal figure. In this way, we are building our strengths / expertise that other companies can not imitate. Our overseas deployment started from 2010. We currently operate our overseas businesses only in China with our wholly owned subsidiaries in Shanghai and Dalian. While developing the businesses based on these directly operated companies, we have concluded agency contracts with several agencies to provide products and services at about 20 salons throughout China. In order to intentionally advance our business development targeting the wealthy people mainly in China as well as in Asian countries where the economic development is particularly remarkable, we are recruiting local partners that can build business alliance in each country. Diana’s business is the franchise business itself. We are aiming for “Diana lasting 100 years”. It is necessary to constitute business in line with trends of ever-changing times and customer preferences. As a franchisor, it is obvious that we need to create new business types and develop new markets and customer groups, but we also consider that promoting business type development is important to further strengthen the existing differentiated business models. Based on our business type development in the field of beauty and health cultivated for over 30 years, we are also working on the area of CSV (Creating Shared Value), such as supporting women’s activities and developing businesses rooted in the area to create a new profile of Diana. As the current and core business type development, we are developing the inner beauty business focusing on food and drink, the total beauty business such as hair, makeup, facial, nail, and foot care as well as the apparel business. From now on, by accelerating the development of these business types, we are working to become a public institution in a truly meaningful way. As it is attractive that the expansion of consumption by middle class layers accompanying the rise of emerging countries, we regard BOP as a promising growth market. As a matter of course, we are focusing on the corrective undergarment as the business of Diana, but we believe that the inner beauty business and the total beauty business, which we currently develop in our business types, are effective as a business for entry. We would like to expand the current 20 salons in China to 50 salons within Asian countries in 5 years. Diana’s franchisee, so called Chief Proportion Counselor, provides: “Beautiful Life” that fulfills the woman’s dream of beautiful well-proportioned figure and nurture a vibrant sound and rich mind, as well as “Rich Life” that can be self-realized by creating healthy time with friends and economic affluence to expand the range of life. The business of Diana is successfully established as the franchisee considers from the standpoint of the site and the franchisor supports it from the backend. Franchise business will not be established unless franchisor and franchisee are love each other. In the past 30 years, Diana has designed business models that optimize the development of franchisee and considers the success of franchisee is the primary goal. The role of franchisor is to promote the development of products, sales methods and business environments that are appropriate to the times, from the perspective of “to eliminate obstacles and support possibilities” so that franchisees enable to maximize their full potential. We value this point of view and will continue to fully support the further development of our franchisees in the future.